With excellent opportunities for wildlife viewing, gorgeous beaches and a lush green rainforest, Manuel Antonio National Park is a must-see destination in Costa Rica. It is located on the Pacific Coast of the country, about a 3 hour drive from San Jose. The weather in Manuel Antonio National Park is hot and humid year-round, with temperatures ranging from 27 °C (81 °F) to 30 °C (86 °F). The rainy season is from May to November while the dry season is from December to April. The dry season also happens to be high season and the park gets very crowded. Weekends and Costa Rican holidays are also busy times so before booking your trip check if there is a Costa Rican holiday if you want to avoid the crowds. The park has capped the number people allowed inside at one time at 600 people on weekdays and 800 on weekends. If you arrive later in the day you will probably have to wait in a long line. I visited in mid-November and while I saw quite a few tour groups, there was plenty of space to walk on the trails and the park was not crowded at all. If you want to visit the park when it is less crowded, go sometime between September and November. However, these are the rainiest months so you may want to spend several days in the area in case the weather is bad. It was sunny the morning I visited the park although it rained in the afternoon. As the wildlife in the park tends to be more active earlier in the day and the temperature cooler, try to get there as early as possible. The park is open from 7am- 4pm every day except Mondays. If you are going without a tour, the admission fee is $16 per person. If you have a car, you will also need to pay for parking. No sweet food like candy or chocolate is permitted in Manuel Antonio National Park as animals may be attracted to your bag. You can bring non-alcoholic drinks, peeled and packaged fruits, and individually packaged sandwiches. At the entrance to the park, your bag may be checked for food. To play it safe I didn’t bring any food at all. At the end of the guided tour I took, we were served fruit slices and juice at a restaurant right outside the park. Do not feed, tease or touch any of the creatures in the park. With their long fingers, capuchin monkeys can easily unzip backpacks! Should You Take a Tour or Explore on Your Own? You are not required to hire a guide and are free to explore the trails and look for animals on your own. If you see a large group of tourists gathered in one area, there is probably a sloth nearby. You can just wander along the path and look for large groups. But since they paid for a tour and you didn’t, you shouldn’t linger nearby and try to hear what their guide is saying. In my opinion, you will have a much better experience in Manuel Antonio National Park if you take a guided tour. This is because guides are experts at spotting animals, especially small ones like birds, frogs and lizards that you would have difficulty seeing on your own. Without a guide, you will walk right past some animals without noticing them, and miss out on some interesting commentary! A lot of creatures tend to blend in with the trees. Never would have spotted this iguana without a guide! All guides carry a large telescope which they will set up and let you look through. Just by holding your phone up to the lens, you can get closeup photos of animals! A frog as seen through a telescope. At the park entrance, you will encounter some guides waiting around with telescopes. As these guides may be unlicensed or only recently licensed, it’s better to search for a guide online or ask your hotel staff for recommendations. If you do decide to hire a guide at the entrance, ask to see their ICT card first to make sure they are licensed. I decided to book a tour with Costa Rica Jade Tours due to their many excellent reviews on TripAdvisor. It was easy to book through their website. The price was $50 USD per person- not cheap but worth it as the guide, Jason Solano, was excellent! He was very enthusiastic and informative, constantly checking the trees and listening for wildlife. Other tour guides respect him and look to him for guidance, as during the tour a few guides approached him for help spotting animals and I saw others peeking at our group. Costa Rica Jade Tours limits the number of tourists per group to 8-10, which gives everyone plenty of chances to look through the telescope and ask the guide questions. You may be concerned that you won’t have enough time to explore the park or relax on the beach if you take a tour (round trip transportation was included in the price of mine). I was happy with the amount of time in the park and the amount of animals I saw, but if you do want to stay in the park longer and find your own way back to your hotel just inform your guide so they won’t think you got lost. Manuel Antonio National Park is home to a wide variety of mammals, reptiles, and birds. Here are some of the most common ones. The white-faced capuchin monkey is Manuel Antonio National Park’s most famous monkey. You will see them in many tourism ads. They love to steal food from tourists and rummage through backpacks, sometimes working in teams with raccoons. 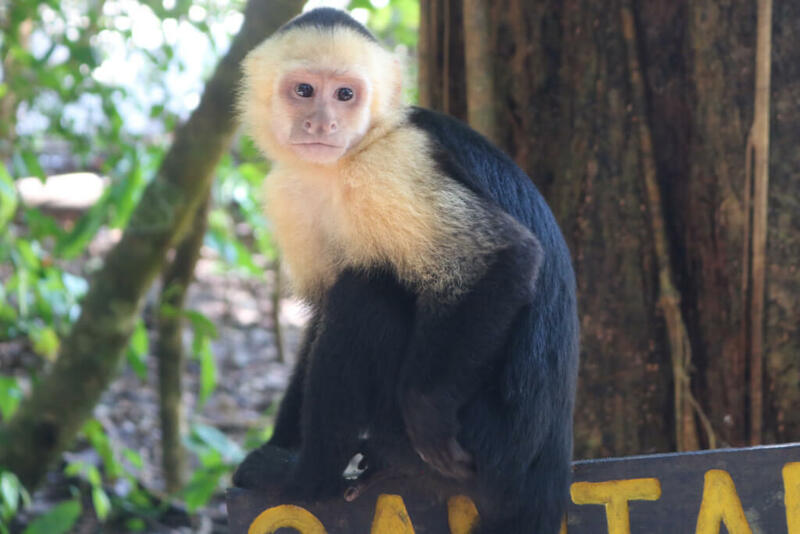 Many white-faced capuchin monkeys hang out at Manuel Antonio Beach. Known for their loud howls that can be heard from several kilometers away, howler monkeys spend a lot of time sleeping in trees. Due to deforestation, the squirrel monkey is an endangered species. Manuel Antonio National Park is one of the few places where you can see them. This toucan with a large bill can only be found in certain parts of Costa Rica and Panama. In Manuel Antonio Park, you will find many raccoons at the beach, chewing on trash. One of Costa Rica’s most famous animals, the sloth, can usually be found napping in trees. In Spanish, sloths are known as osos perezosos (lazy bears). If you hear a guide saying “perezoso” in the park a sloth is nearby! You will often see a ball of fur in a tree (which is sometimes mistaken for a bird’s nest). I was lucky enough to see one sloth climbing in a tree in Manuel Antonio National Park. The other sloths I saw were napping. The white-nosed coati is a member of the raccoon family. They like digging holes for food. While there are no accommodations within the park itself, there are plenty of places to stay nearby. Most visitors to Manuel Antonio National Park stay in the town of Manuel Antonio or the town of Quepos. I stayed at La Mansion Inn, a charming hotel in Quepos located at the top of a hill with spectacular ocean and rainforest views. The staff were among the friendliest and most welcoming I have ever encountered at any hotel, and I have stayed in many, many hotels. One morning at breakfast, I saw that the staff had decorated a table with balloons for a guest’s birthday. When she arrived at the table with her friends, she was served some cake and the staff gathered around and sang Happy Birthday to her. Upon arrival each guest is given a tour of the hotel and introduced to the hotel iguana who can often be found lounging by the pool. There is also a large fish called Charlie in the aquarium in the lobby. I was delighted that whenever I moved to the opposite side of the tank, he would automatically follow me, pressing his face against the glass. I had dinner in the restaurant twice and the filet mignon with mushrooms was so delicious I ate it two nights in a row! Overall the food in the restaurant greatly exceeded my expectations. My room had a magnificent view of the ocean and I even saw a few monkeys on the balcony sneaking past my room! The hotel has a self-serve laundromat where you can use the washer or dryer for $7 each. Laundry detergent is provided by the front desk. After some time traveling, it was wonderful to be able to do my own laundry! Ohhh I really wanna see the a sloth in my lifeee!! They are such an amazing creatures hehe. Love all other shots too, sometimes thinking about getting a job in a national park hehe, so much fun! I completely agree that explored with a guided tour is the best. I learned so much from the well educated and informative guides when I visited Costa Rica. Pura Vida!